If you are going to go on a walk and the child doesn’t put on his/her shoes then the logical consequence is that his/her feet will get hot (or hurt). Most likely they will not be fatally injured, but will be uncomfortable enough to remember next time that they should put on their shoes before leaving the house. If a child didn’t eat his/her food then someone else in the family would eat it. If her kids wouldn’t put their toys away at the end of the day she would put them (the toys, not the kids) in the attic for a couple of days. One time she made a two-layer chocolate cake with frosting. 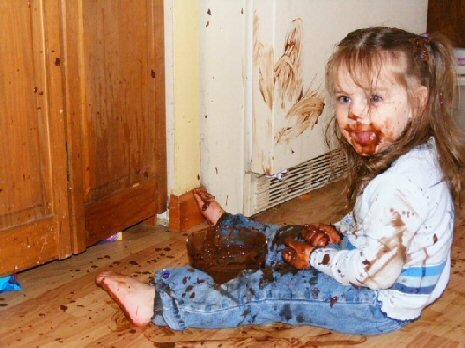 She came back in the kitchen to find that someone had eaten all the frosting off the cake. None of the kiddos would admit to eating the frosting. So when it came time to serve the cake after dinner, the logical consequence was that she served the cake with no frosting. I like her cake consequence because it requires the culprit to be faced with the crime. I would have most likely said that no one gets to eat cake…but her consequence is more related. The day I interviewed my MIL we had an “incident” at lunch. My middle son kept poking my youngest son, making him get frustrated and scream. I asked my MIL how she would have handled it. She said she would tell the child that “we don’t poke people at the table while we are eating” (maybe even point around the room and show how people are behaving). Then offer him the choice, “you can choose to sit nicely and keep your hands to yourself or you may choose to sit next to me where it won’t be a problem.” I like how she then would say, “we can do that. right?”…putting the behavior in the “we” phrasing makes it sound like it’s team effort. Do you use logical consequences? OR Do you struggle to come up with good logical consequences? I too try for the logical consequences, but find it especially difficult with children approx. 4 and under. Here’s the trouble – my 3 year old would totally pull the no shoes strategy as in the 1st example. he’s so little yet, that i would be the one who would suffer if his feet got hot. he’d probably scream and tantrum, then lay down on the ground on the way home. eventually, i’d have to pick him up and carry him home, which is virtually impossible with a baby and another child to get home safely. So instead, I would probably say go ahead, and then bring shoes along, which totally defeats the purpose. I know that there is a parenting with love and logic for preschool age, so maybe there are logical ways to go about with littles, but I find it hard. I agree angie. I think logical consequences is hard for kids under 4. But it’s possible to use them sometimes. I heard a parenting expert say that consequences may only be effective in about 20% of behavior challenges. Just one tool. An example for little ones…if we go outside in the front yard, I would tell him that he could not go past the sidewalk. The consequence if he did cross the boundary was that we went back inside. thanks angie…always asking good questions!